An aircraft modeled by a a Turkish designer and planned to be mass-produced by a Turkish aerospace company has won an excellence award with a "gold distinction" at the International German Design Awards, media reports said Monday.. The "Turkish Eagle ALPINA", created by the design center Designnobis team led by Hakan Gürsu from Turkey's Middle East Technical University (ODTÜ), was awarded the "Excellent Product Design" award with a "gold distinction" in the "aviation, marine and railway vehicles" category. 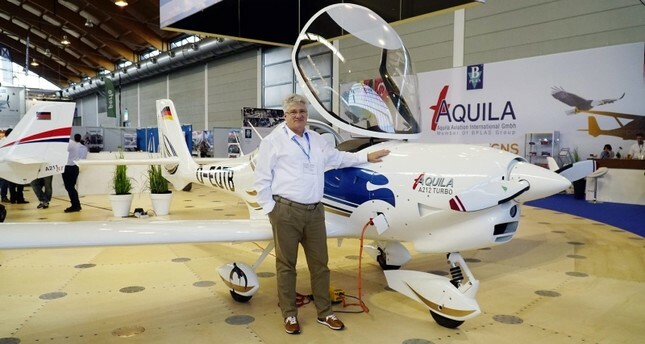 The award ceremony was held as part of the International Frankfurt Fair, and saw the attendance of worldwide industry giants as well as Celal Gökçen, the owner of the Aquila aviation factory. The aircraft will be produced and developed by Aquila and the Bursa Aerospace and Aviation Company. Speaking to Anadolu Agency after the award ceremony, Gökçen expressed his gratitude to Gürsu, who won the world's best designer award in 2014, saying that this award was especially important as it was the first aircraft design to win gold in ten years, and one of its "major commercial competitors" had only managed to receive bronze in 2017. Described as "a pleasantly compact and exciting sports aircraft" by the jury of the competition, the Alpina was ideally designed for short distances. The aircraft, which can land on both ground and the water thanks to the floats under its half-wings, was designed with the concept of recycling in mind, which has only been a recent trend around the world. The parts of this energy-saving aircraft will be used in other aircrafts after it completes its life cycle, hence contributing to recycling and reusing efforts. The award-winning aircraft which can fit four people, is planned to be used in critical cargo services and organ and patient transports.